The next morning, Ron walked in on the office and found Harry sitting with some papers " So tell me" Ron said and sat down in his chair. " Did you get laied last night?" Harry rolled his eyes to Ron. " A) That&apos;s so not of your buisness and b) i just helped her home"
" I was just joking" Ron mumbled. Harry was about to say that it was fine when Kingsley stepped inside. " Guys, I need you two, there is someone who want to talk to you"
" Parvati Patil?!" Harry said shocked when he saw the same girl he went to the Yule Ball with. " What are...?" Ron said just as shocked as Harry. " Look, I need to talk to you two. It&apos;s important"
" What is it about?" Harry asked.
" It&apos;s about what happened to Katie. She&apos;s gone missing, you know right?" " Yeah " Ron replied hastily.
" I think I know why. I talked to her just the day before she disappeared. And...."
She didn&apos;t have time to continue because a loud BANG interrupted them. The whole section Ron and Harry was working at fell into pieces. Smoke from the explosion was everywhere and Harry covered his mouth and nose with his hand.
" Ron?! Are you alright?" He said with panic in his voice. Ron moved carefully on the ground. " I&apos;m fine. What about Parvati?" Harry looked around and saw Parvati laying on the floor, blood all over her face. Suddenly Harry saw a dark figure in front of him. Another death eater, he tried to stand up but he was too weak. The smoke was taking it&apos;s way into his lugns. All he could see was the blue eyes, like Astoria had mentioned.
" Harry..?!" Parvati breathed and tried to crumble away, but the man took a grip of her. " Let her go!" Ron yelled but coughed and couldn&apos;t stand up. The man took Parvati with him and disapparated. The next second everything went black. Harry and Ron later woke up at St Mungos and was later released. They was greeted by Hermione and the rest of the gang at the burrow. " Harry!" Hermione said and flew into his arms.
" We were so worried "
" We&apos;re fine Hermione" Ron said and hugged his little sister.
" What happened to Parvati?" Ginny said worriedly and took Blaise&apos;s hand.
" We don&apos;t know" Harry replied. " All I saw before I fainted was the death eater who....kidnapped her"
" Oh my god...." Ginny gasped and Blaise laied his arm around her shoulders.
" Ginny, Hermione, I don&apos;t want you two to walk around alone from now on" Harry said as an over protective brother. " Harry stop it" Hermione mumbled.
" This is not a game Hermione!" Harry said, slightly irritated. " Both me and Ron, and of course Draco and Blaise would freak out if we lost you"
" We know that, but..." Ginny said but Ron cut her off.
" Ginny! 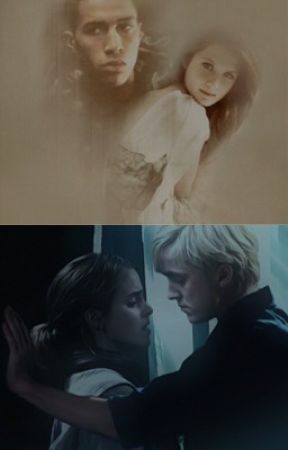 Just be careful, please"
Draco laied his hand on Hermione&apos;s cheek and whispered. " I beg you, Hermione "
" I promise I&apos;ll be careful, Draco" with that, she kissed him.